Euro backing down from yesterday’s wild run. It changes to snow with up to an inch along 40. It’s actually a tick south so it s better along 40 than north. Meh overall. Gives us northeast Tn folks a little love, albeit not much. More in the mtns per usual. Valley areas look to get 1-2” on this run. Better for northern valley, which is typical. For whatever reason, areas along the foothills have slightly improved with the last two runs. I've went from less than 1" to a little over 2" now. Moisture does sometimes get "trapped" on the west side of the mountains in these type of events, and lingers longer than the western end of the valley (west of Knox). 60's Saturday with thunderstorms late, then a coating of snow on Sunday. Could be worse. Happy the more colorful map is the Euro. Verbatim- it's a meh run but that it continues to trend south is adding some intrigue. Did you know that the gestation period for a goat is 150 days. That may mean something here. See if you can figure it out. Nam looked better that run, both 12 and 3k. Of course it's the Nam but it's should be getting into it's range tomorrow even better. 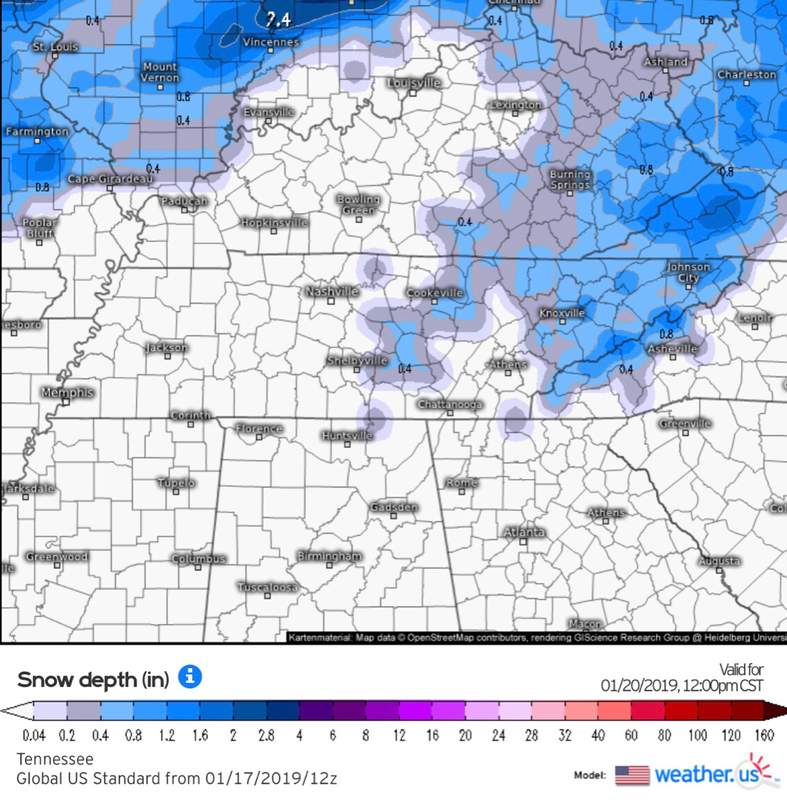 I noticed the 0Z NAM 3km gives Dyersburg about 6" and Memphis metro looks like 2-3 inches.The NAM 12km is just a dusting. Wow Clint I know its the 3k Nam but, its picking up something different than the other 2 NAM Models. I hate to be meteorologist figuring out this forecast. What a rollercoaster ride. I have been watching the 3k also the last few runs, it started picking that up the previous run. Also noticed the 12k somewhat trend toward that this run a little. Just something to watch. Plenty of tracking to do this week. 3km NAM still seems to be the one showing the best chance of snow with this system from looking at the 12z coming out. 12z NAM3 - 18F temp drop over the course of 6 hours (H42-48). That's insane. You can probably cut those projected totals in half as the first wave gets absorbed by the wet ground, but an inch of accums is still in play for some.